My comforting scent has the tenderness of an armful of spring flowers, the innocence of a childhood memory. Subtlety of lilac blossoms, green freshness of lily of the valley and fine fullness of the ylang-ylang, I am the fragrance of emotion par excellence. Cariacou Mini-12hours - Other sizes/options. Cariacou Demi - 25 Hours - Other sizes/options. Cariacou - a luscious, delightful scent, with pleasureable notes of Pink Grapefruit and Blackcurrant, floral notes of Jasmine and Rose and soft notes of Vanilla, Santal Cedar and Musk, perfect for any occasion. Demi size only. Chevrefeuille Mini-12hours - Other sizes/options. Chevrefeuille 25hours - Other sizes/options. 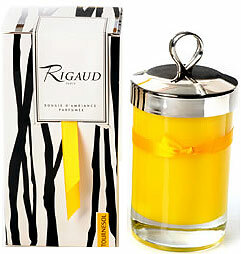 Rigaud Cythere Candle (Large) is a blend of jasmine, red fruits, spices, cedar, and white musk. 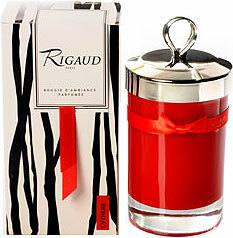 This rich, complex fragrance has a lovely contrast of red fruits combined with hints of jasmine, and a slightly musky backdrop that everyone will enjoy. Tournesol, Sunflower Mini-12 hours - Other sizes/options. Tournesol, Sunflower Demi-25 hours - Other sizes/options.